The first problem the machine had were the batteries had been forgotten about. So the battery holder was replaced and new batteries were installed. All too common a problem. While replacing the batteries, I noticed some burned circuitry. The burned driver circuitry was related to the lower pop bumper. Whenever I see this kind of damage, I always check the fuses. Sure enough someone installed a 7 amp fuse where it should only be a 2 amp fuse. 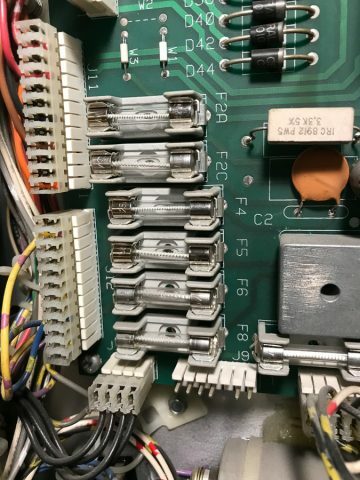 Some of the fuses in an Williams System 11 pinball machine. Out of the 6 fuses shown above, 3 were incorrect values, all higher than what they should have been. The fuses are meant to protect against this kind of damage. 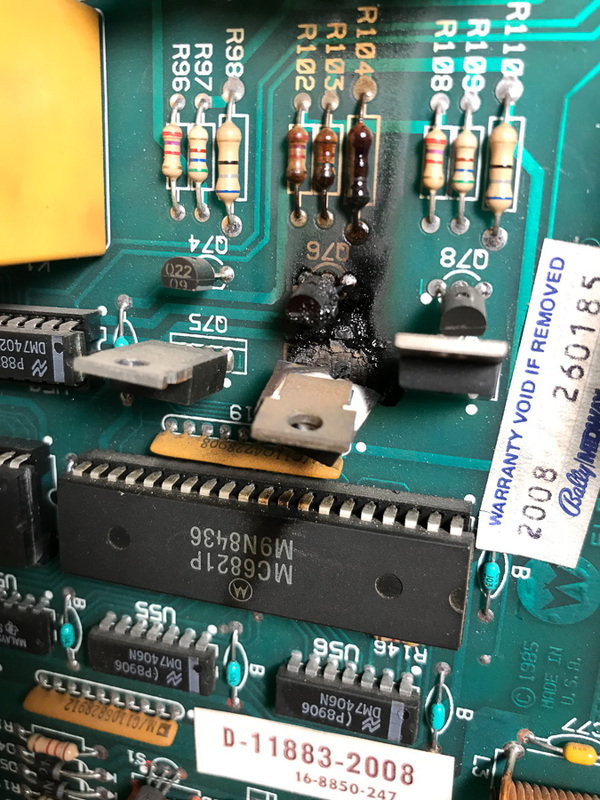 Often in the history of a pinball machine, someone will replace a fuse with a higher rated fuse to keep it from blowing again without every investigating why the fuse blew in the first place. I’m not really sure why people do this. 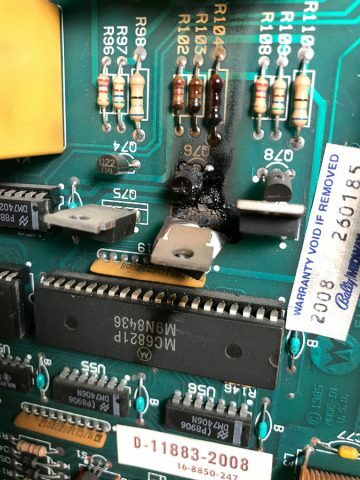 So instead of just simply having a blown transistor, the circuit board got damage and the pre-driver transistor, 7402 chip, and the coil were all damaged and had to be replaced. The 7 amp fuse never blew to protect the circuits. Instead the transistor caught fire and burned until it acted as its own fuse and the circuit eventually opened. The actual cause was the switch contacts on the pop bumper being adjusted too close together. Causing the pop bumper to energize continuously. This wasn’t my customer’s fault. The blame probably goes to the operator who first purchased the pinball machine and placed in a public location to make money. A fuse or two probably blew and to keep the machine making money, installed larger fuses. Then eventually the pinball machine ends up in a home environment with the wrong fuses installed. The first thing was to check the reset pin on the microprocessor (U15, pin 40). The reset pin was staying low (zero volts). The System 11B has two parallel reset circuits that will hold the system in reset if the +5 volts or the +12 volts is missing. I checked both voltages at J17 in the upper left of the MPU board and the +12 volts was missing. So I went further upstream to the test point 3 (TP3) on the power supply board; there was 12 volts at TP3. I went to check the +12 volts at the top of the power supply board at J1, and as soon as I touched it, the machine booted up. It appeared that the White/Gray wire going to pin 6 of the J1 was not crimped well into the connector. I pulled it out of the housing and re-crimped it. I also removed the power supply board and check for cracked solder joints on the connector. They were okay. The machine booted up fine after that.